Welcome to our website full of fun online activities! ELM Interactives for Grades K-8 is designed to help young students develop and practice computer, online literacy and research skills. ELM Interactives for Students is a collection of instructional activities on the ELM databases created by librarians in the Reference Outreach and Instruction unit of Minitex utilizing the Student Interactives hosted on the ReadWriteThink site and provided by the International Literacy Association, National Council of Teachers of English, and the Verizon Foundation's Thinkfinity. To explore and learn more about using the ELM databases, please visit the ELM Learning Center. Each set of ELM instructional activities and Student Interactives are organized by activity and grade level and intended to be teacher initiated and guided. However, any of the activities can be modified to fit any grade, student, or assignment. Navigate to the various activities using the side bar to the left. The Student Interactives highlighted on this website require Flash and are best used on a desktop or laptop computer. For additional assistance using the Interactives please consult Technical Help. These instructional activities can be viewed and used on-demand, whenever they're needed. Permission is granted to share, modify, and use all the instructional materials that are created on this site by the Minitex librarians with proper attribution. Each instructional activity has been made available for download in Word and PDF at the bottom of each corresponding webpage. 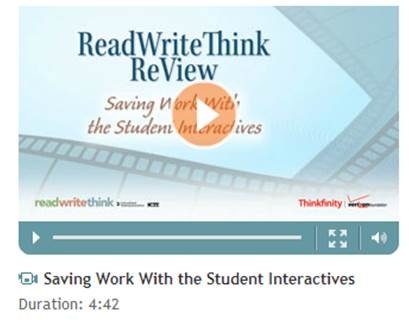 As students use the Interactives on the ReadWriteThink site they may not be able to finish their work in one class session. Some of the Interactives have a Save feature. Watch this video to learn how students can save their work so that they can finish it later.